This simple pile of vegetables and herbs will be transformed into vegetable stock, which I will then can and have on hand to use in making a variety of dishes. Ever since I bought my pressure canner two years ago, I stopped buying vegetable and chicken stock. While I primarily use vegetable stock in the majority of my dishes, I make homemade chicken stock throughout the year as well. This morning, I gathered my ingredients and put them all on the counter. Armed with my favorite Hammerstahl chef’s knife, a vegetable peeler and a garbage bag ( for scraps, shavings, ends, etc. ), I begin to prepping the vegetables for the pot. Now, the Ball Canning Book I use has some really great recipes. When I know I will be canning, I try to use only tested recipes. 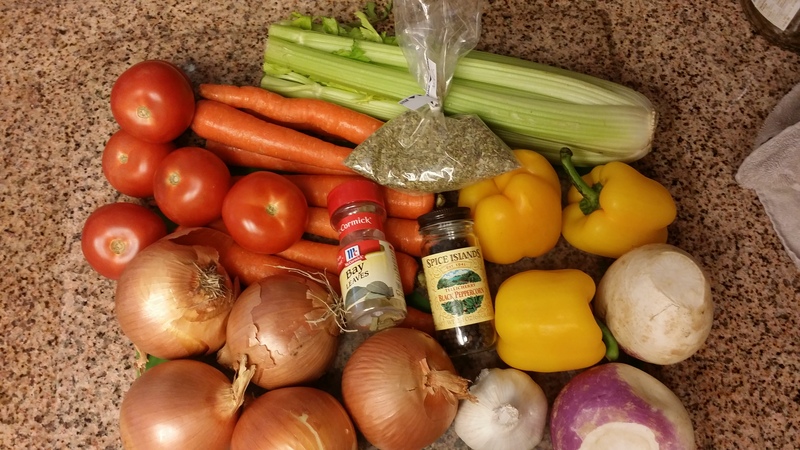 I have tried several vegetable stock recipes over the last couple of years and this is just the best one for me. Instead of just making one 7-quart recipe, I got out another stock pot, and am making 10.5 quarts. The prepping takes about an hour, if you’re doing it yourself. If you have helpers, you can cut that time by half, depending on their skill level in the kitchen. I will point out, this is a great way to show kids how you can prepare store-bought items at home, have them be healthier and they can sample the ingredients that make up the stock. 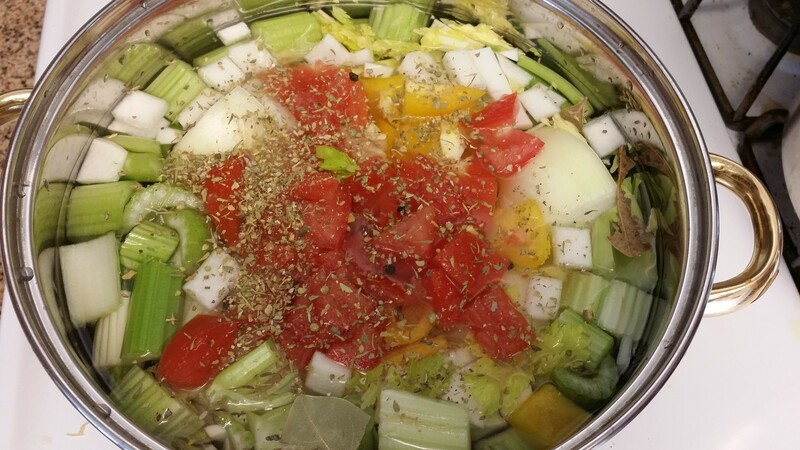 Once on the stove, the veggies will cook, the water will fuse with the vegetables, and turn a yellow-brownish color. Depending on some of the ingredients used, that will determine the final stock color. Red onions and red peppers will definitely add a depth of color that yellow onions and/or peppers won’t. This particular recipe calls for bringing the mixture to a boil, reducing the heat to low and cook for two hours, covered. After two hours, remove the lid(s) and simmer another two hours. 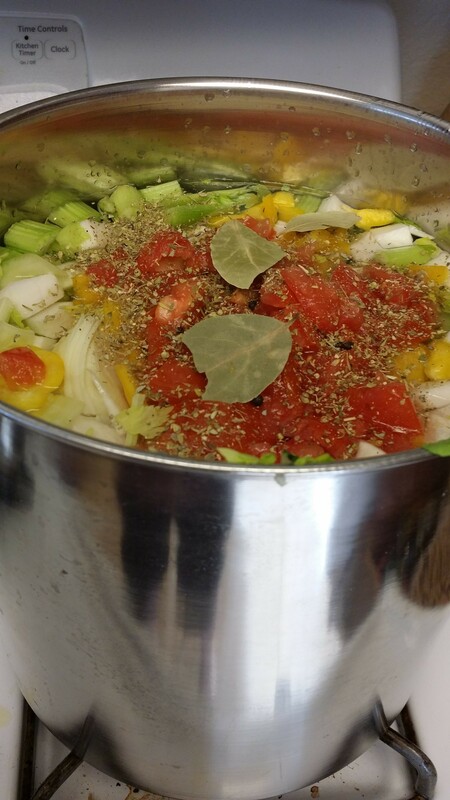 Then remove vegetables, strain through cheesecloth and begin the canning process. Since I use a local farm stand to purchase my ingredients, I always buy them just a day or two before I will make the stock. When canning, you want to use the freshest ingredients possible, to avoid bacteria growth. Another benefit of making your own stock is that you can do so chemical and sodium-free. There are no added preservatives in this stock. My canning season is starting. I will typically can at least once a week now, depending what’s in season. Having food allergies, intolerance, or whatever the term is these days, makes purchasing some prepared foods very difficult. I enjoy making homemade dishes for my family, using homemade ingredients such as stocks and sauces. The best part of this is the cost-savings. Depending on the ingredients used, each 16-oz. jar (or pint) only costs me $0.50-$0.75 to make. I always have a massive collection of canning jars on hand. By mid-summer, I may need to purchase more, only because I am canning more and more every year. 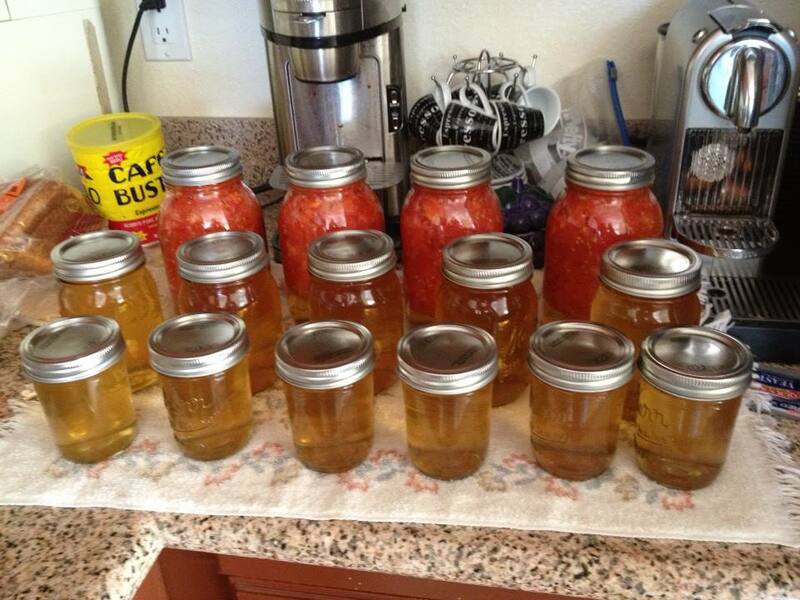 I admit, canning can be labor intensive and even more so if you are the only cook. When all is said and done, I am please with what my efforts yield. Vegetable stock and tomato sauce.